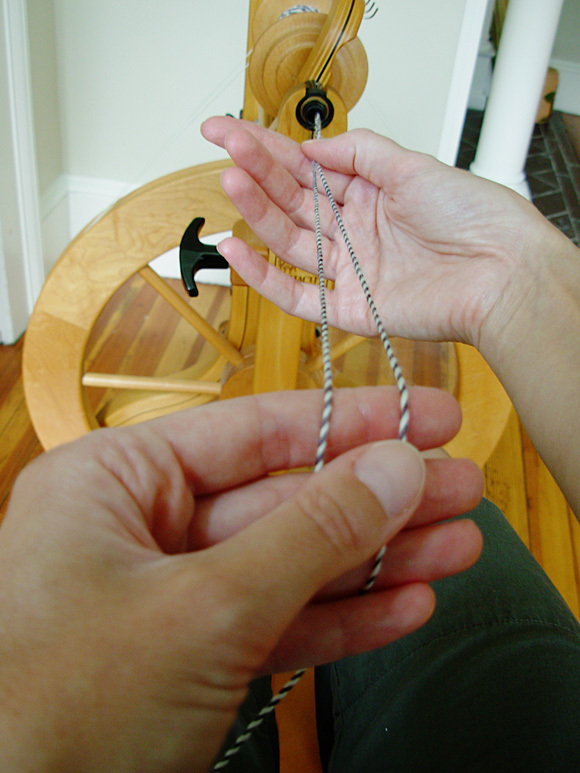 A basic cabled yarn is made by taking two standard two-ply yarns and plying them together again in the opposite direction. Why would you want to create a cabled four-ply yarn rather than simply plying four singles together? For one thing, cabling creates an incredibly strong, abrasion-resistant yarn—even stronger than that created by regular plying—which makes it perfect for knitting long-wearing handspun socks. For another, you need only three bobbins to make a four-ply cable: two on your lazy kate filled with the two-ply yarns and the third on your wheel, a boon for those of us without half a dozen empty bobbins in our spinning baskets. Begin by spinning your singles as you normally would for a smooth, two-ply yarn, and then allow the twist to set overnight. (I’m using light and dark strands here to make the process easier to see in photos.) 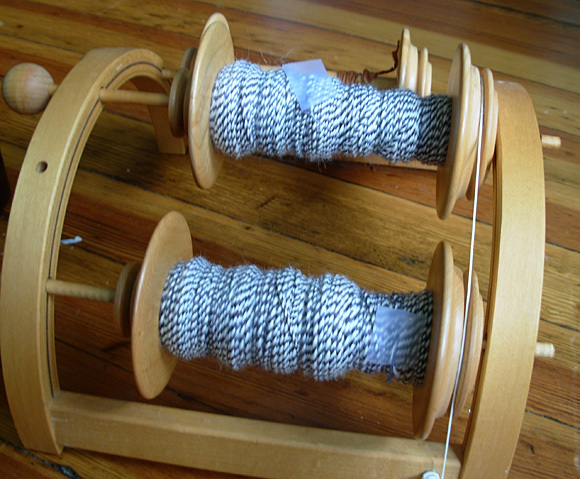 Then ply the two singles in the opposite direction, making sure to add plenty of twist. 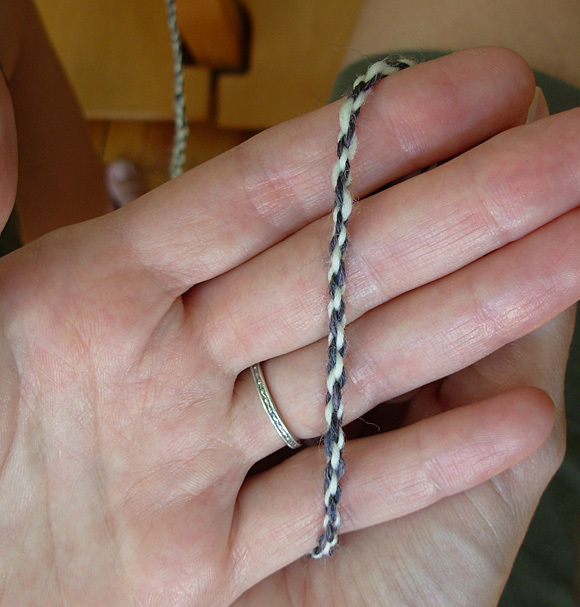 You are actually aiming for an overplied—not a balanced—yarn. 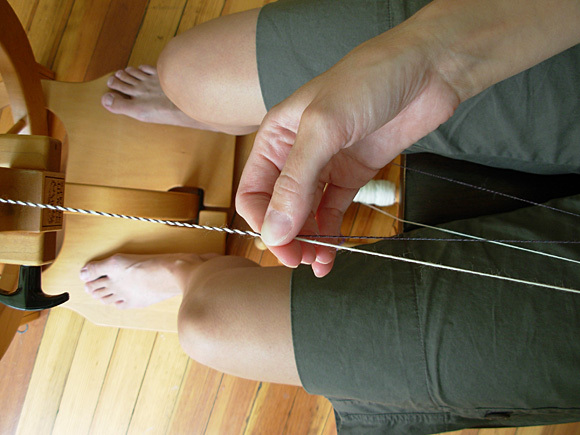 You can test whether your plied yarn has sufficient twist energy to create a balanced cable by hanging your orifice hook over a section and letting the two-ply twist back on itself (this is the same trick you use to test the twist in singles). 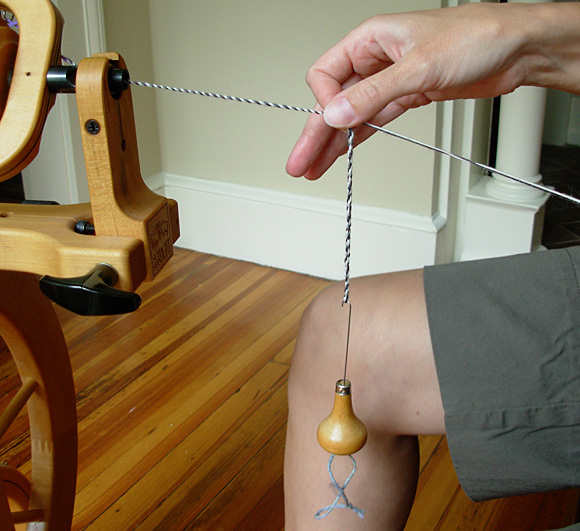 Alternately, you can follow Judith MacKenzie’s recommendation and make a balanced two-ply from your original singles and then run it through your wheel again, adding additional twist in the same direction to make sure you have enough twist. Your two-ply yarn will have an overabundance of twist energy, so you may find that you need to secure the ends with a bit of tape. Once you have two bobbins of overplied yarn, don’t allow the twist to set: go ahead and cable your yarn right away so you can evaluate the twist energy in the final yarn. This time, your goal is a beautifully balanced yarn. You want to create your cable by plying in same direction that you used to create your original singles. For example, if I spun my singles S-twist (counterclockwise), I’d spin my two-plies with a Z-twist (clockwise), and then cable the two two-plies together with an S-twist again. 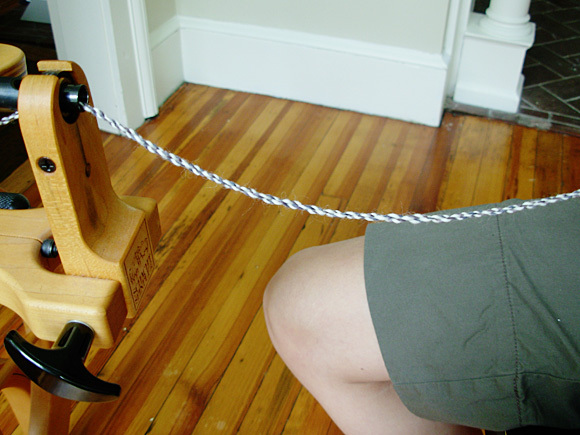 Test your yarn occasionally as you work by allowing it to hang down without tension to be sure that the cabled yarn is not over- or undertwisted. You can get fancy and cable more than two two-ply yarns together; you can even cable two or more Navajo-plied yarns together. How does cabled yarn behave when you knit it up? As with plump, multi-ply yarns, cabled yarns give you great stitch definition—stockinette is nice and smooth and cables really stand out. But cabled yarns can be heavier and denser than other yarns with similar diameters, so sample before you decide to spin a thousand yards for an elaborate Aran sweater. You might find that you want to plan a finished yarn that will knit up at a finer gauge to compensate for the extra weight. Knitters should also be aware that their knitting style—Continental or English/American—will also have an effect on the fabric they create with a cabled yarn. Judith MacKenzie, in The Intentional Spinner, notes that cabled yarns in which the singles are spun with an S-twist will loosen when knit Continental style; the same thing will happen when a cabled yarn with Z-twist singles is knit in the English style. This may or may not bother you. As always, sampling before spending lots of time at the wheel is the best way to avoid unpleasant surprises later. Judith MacKenzie (in The Intentional Spinner and in Spin-Off, Spring 2008) and Amy King (in Spin Control) both offer excellent instructions for creating cabled yarns and experimenting with their many variations. If you’re a spindler, check out Abby Franquemont’s Respect the Spindle for complete info on making cabled yarns with only a handspindle. I definitely recommend giving cabled yarns a try. It’s true that creating a cabled yarn is time consuming, but I find that because the building blocks of this yarn type are so simple, I can spin along on autopilot for much of the time, making the work relaxing and meditative. And knowing that the resulting yarn is durable enough to pass on to the next generation makes it feel like time well spent.